In my last post I dabbled in chemistry, so I thought it made sense to discuss the origin of the word. scientific study not so called until 1788. The alchemists became obsessed with their quest for the secret of transmutation; some adopted deceptive methods of experimentation, and many gained a livelihood from hopeful patrons. As a result, alchemy fell into disrepute. However, in the searching experimental quests of the alchemists chemistry had its beginnings; indeed, the histories of alchemy and chemistry are closely linked. Transmutation of elements has been accomplished in modern chemistry. Now when I see Egypt and kam or khame - I can't help but thinking of חם Cham, the son of Noach, the father of Mitzrayim - the biblical Egypt. And indeed, in Tehillim (78:51, 105:23,27, 106:32) Egypt is called Cham. Despite the attractions of the various theories, however, not one of these etymological suggestions is acceptable. He goes on to give a thorough argument, which includes the fact that the Hebrew letter chet "is not transliterated at all or is transliterated by a vowel" in Greek - as in Noach נח becoming "Noah". One thing is, however, absolutely clear. The name Ham is not related to the Hebrew or to any Semitic word meaning "dark," "black," or "heat" or to the Egyptian word meaning "Egypt". To the Early Hebrews, then, Ham did not represent the father of hot, black Africa and there is no indication from the biblical story that God intended to condemn black-skinned people to eternal slavery. While I agree that the Bible did not justify the slavery of Africans, I'm still not fully convinced of the etymological proof. People from one language can refer to another nation by a word that sounds like what they call themselves, without fully matching up with the lingustic laws that generally determine word borrowings. Just look at how the Europeans "converted" the indigenous place names when they came to the New World. Some are so far off that it's hard to even see a connection (for example see here for the etymologies of the U.S. state names). 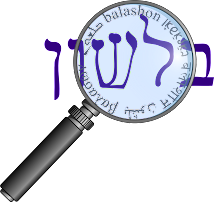 One person who did believe that there might be a connection between Cham and Khemia was Yitzhak Avineri. In a 1945 article published in Yad HaLashon (page 202), he complains about how recently the spelling of the Hebrew word for chemistry - chimiya - has changed from חימיה (with a chet) to כימיה (with a kaf). While the linguist pushing for the change base it on the Arabic cognate al-kimiya, he gives two proofs: 1) that chimiya might originate either in the chum (dark) color of the Nile soil, or be related to Cham, and 2) everyone pronounces the word chimiya, not kimiya. If it was to be spelled with a kaf, it would require a dagesh in the beginning, making it kimiya (my guess is the pronunciation is influenced by those of European languages, such as the Russian khimiya.) Avineri quotes a couple of dictionaries that still spell the word with a chet, but the new spelling won out, and only כימיה is found today.